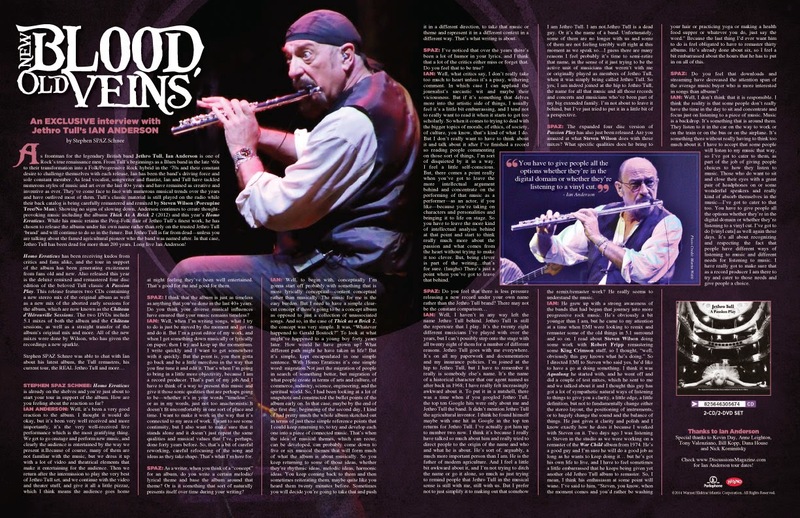 Discussions Magazine Music Blog: An EXCLUSIVE interview with IAN ANDERSON (Jethro Tull)! An EXCLUSIVE interview with IAN ANDERSON (Jethro Tull)! As frontman for the legendary British band Jethro Tull, Ian Anderson is one of Rock’s true renaissance men. From Tull’s beginnings as a Blues band in the late ‘60s to their transformation into a Folk/Progressive Rock hybrid in the ‘70s and their constant desire to challenge themselves with each release, Ian has been the band’s driving force and sole constant member. As lead vocalist, songwriter and flautist, Ian and Tull have tackled numerous styles of music and art over the last 40+ years and have remained as creative and inventive as ever. They’ve come face to face with numerous musical trends over the years and have outlived most of them. Tull’s classic material is still played on the radio while their back catalog is being carefully remastered and remixed by Steven Wilson (Porcupine Tree/No Man). 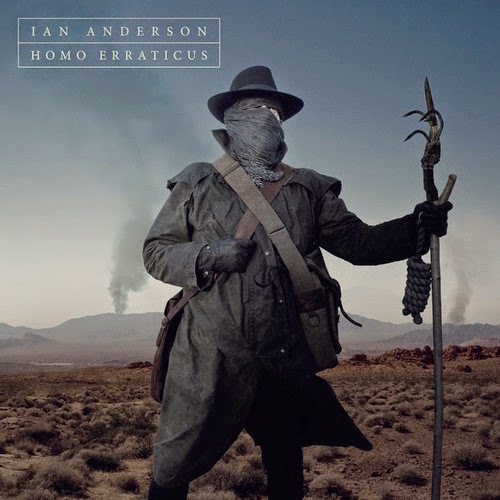 Showing no signs of slowing down, Anderson continues to create thought-provoking music including the albums Thick As A Brick 2 (2012) and this year’s Homo Erraticus. While his music retains the Prog-Folk flair of Jethro Tull’s finest work, he has chosen to release the albums under his own name rather than rely on the trusted Jethro Tull ‘brand’ and will continue to do so in the future. But Jethro Tull is far from dead—unless you are talking about the famed agricultural pioneer who the band was named after. In that case, Jethro Tull has been dead for more than 200 years. Long live Ian Anderson! Homo Erraticus has been receiving kudos from critics and fans alike, and the tour in support of the album has been generating excitement from fans old and new. 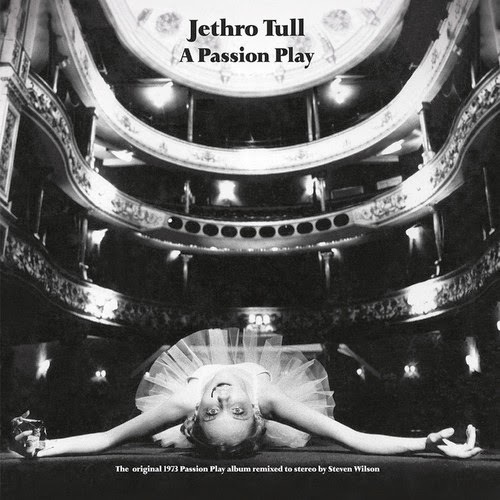 Also released this year is the deluxe remixed and remastered four disc edition of the beloved Tull classic A Passion Play. This release features two CDs containing a new stereo mix of the original album as well as a new mix of the aborted early sessions for the album, which are now known as the Château d'Hérouville Sessions. The two DVDs include 5.1 mixes of both the album and the Château sessions, as well as a straight transfer of the album’s original mix and more. All of the new mixes were done by Wilson, who has given the recordings a new sparkle. STEPHEN SPAZ SCHNEE: Homo Erraticus is already on the shelves and you’re just about to start your tour in support of the album. How are you feeling about the reaction so far? IAN ANDERSON: Well, it’s been a very good reaction to the album. I thought it would do okay, but it’s been very well received and more importantly, it’s the very well-received live performance which is the most gratifying thing. We get to go onstage and perform new music, and clearly the audience is entertained by the way we present it. Because of course, many of them are not familiar with the music, but we dress it up with a lot of video and theatrical elements that make it entertaining for the audience. Then we return after the intermission to play the very best of Jethro Tull set, and we continue with the video and theater stuff, and give it all a little pizzaz, which I think means the audience goes home at night feeling they’ve been well entertained. That’s good for me and good for them. SPAZ: I think that the album is just as timeless as anything that you’ve done in the last 40+ years. Do you think your diverse musical influences have ensured that your music remains timeless? IAN: Well, when I’m writing songs, what I try to do is just be moved by the moment and get on and do it. But I’m a great editor of my work, and when I get something down musically or lyrically on paper, then I try and keep up the momentum. I write quickly and I want to get somewhere with it quickly. But the point is, you then gotta go back and be a little merciless in the way that you fine tune it and edit it. That’s when I’m going to bring in a little more objectivity, because I am a record producer. That’s part of my job. And I have to think of a way to present this music and give it those sonic qualities that are perhaps going to be—whether it’s in your words “timeless”—or as in my words, just not too anachronistic. It doesn’t fit uncomfortably in one sort of place and time. I want to make it work in the way that it’s connected to my area of work. I want to see some continuity, but I also want to make sure that it stands alone and it doesn’t just repeat the same qualities and musical values that I’ve, perhaps, done forty years before. So, that’s a bit of careful reworking, careful refocusing of the song and ideas as they take shape. That’s what I’m here for. SPAZ: As a writer, when you think of a “concept” for an album, do you write a certain melodic/lyrical theme and base the album around that theme? Or is it something that sort of naturally presents itself over time during your writing? IAN: Well, to begin with, conceptually I’m gonna start off probably with something that is more lyrically conceptual—content conceptual rather than musically. The music for me is the easy burden. But I need to have a simple clear-cut concept if there’s going to be a concept album as opposed to just a collection of unassociated songs. And so, in the case of Thick as a Brick 2, the concept was very simple. It was, “Whatever happened to Gerald Bostock?” To look at what might’ve happened to a young boy forty years later. How would he have grown up? What different path might he have taken in life? But it’s simple, kept encapsulated in one simple sentence. With Homo Erraticus it’s one simple word: migration. Not just the migration of people in search of something better, but migration of what people create in terms of arts and culture, of commerce, industry, science, engineering, and the spiritual world. So, I had been looking at a lot of snapshots and constructed the bullet points of the album early on. In that case, maybe by the end of the first day, beginning of the second day, I kind of had pretty much the whole album sketched out in terms of just these simple reference points that I could keep returning to, to try and develop each one into a piece of connected music. That’s when the idea of musical themes, which can recur, can be developed, can probably come down to five or six musical themes that will form much of what the album is about musically. So you keep returning to some of those ideas, whether they’re rhythmic ideas, melodic ideas, harmonic ideas. You keep coming back to them and then sometimes reiterating them, maybe quite like you heard them twenty minutes before. Sometimes you will decide you’re going to take that and push it in a different direction, to take that music or theme and represent it in a different context in a different way. That’s what writing is about. SPAZ: I’ve noticed that over the years there’s been a lot of humor in your lyrics, and I think that a lot of the critics either miss or forget that. Do you feel that to be true? IAN: Well, what critics say, I don’t really take too much to heart unless it’s a pissy, withering comment. In which case I can applaud the journalist’s sarcastic wit and maybe their viciousness. But if it’s something that delves more into the artistic side of things, I usually feel it’s a little bit embarrassing, and I tend not to really want to read it when it starts to get too scholarly. So when it comes to trying to deal with the bigger topics of morals, of ethics, of society, of culture, you know, that’s kind of what I do. But I don’t really want to have to think about it and talk about it after I’ve finished a record so reading people commenting on those sort of things, I’m sort of disquieted by it in a way. I feel a little self-conscious. But, there comes a point really when you’ve got to leave the more intellectual argument behind and concentrate on the performing of that music as a performer—as an actor, if you like—because you’re taking on characters and personalities and bringing it to life on stage. So you have to leave the more kind of intellectual analysis behind at that point and start to think really much more about the passion and what comes from the heart without trying to make it too clever. But, being clever is part of the writing…that’s for sure. (laughs) There’s just a point when you’ve got to leave that behind. IAN: Well, I haven’t in any way left the name Jethro Tull behind. Jethro Tull is still the repertoire that I play. It’s the twenty eight different musicians I’ve played with over the years, but I can’t possibly step onto the stage with all twenty eight of them for a number of different reasons. Jethro Tull goes with me everywhere. It’s on all my paperwork and documentation and my insurance policies. I’m joined at the hip to Jethro Tull, but I have to remember it really is somebody else’s name. It’s the name of a historical character that our agent named us after back in 1968; I have really felt increasingly awkward about it. To put it in a nutshell, there was a time when if you googled Jethro Tull, the top ten Google hits were only about me and Jethro Tull the band. It didn’t mention Jethro Tull the agricultural inventor. I think he found himself maybe with one hit in Google in the top ten returns for Jethro Tull. I’ve actually got him up to number two now. I think it’s because I really have talked so much about him and really tried to direct people to the origin of the name and who and what he is about. He’s sort of, arguably, a much more important person than I am. He is the father of modern agriculture. And I feel a little bit awkward about it, and I’m not trying to ditch the name or go it alone, so much as just trying to remind people that Jethro Tull in the musical sense is still with me, still with us. But I prefer not to just simplify it to making out that somehow I am Jethro Tull. I am not. Jethro Tull is a dead guy. Or it’s the name of a band. Unfortunately, some of them are no longer with us and some of them are not feeling terribly well right at this moment as we speak so…I guess there are many reasons I feel probably it’s time to semi-retire that name, in the sense of it just trying to be the active unit of musicians that weren’t with me or originally played as members of Jethro Tull, when it was simply being called Jethro Tull. So yes, I am indeed joined at the hip to Jethro Tull, the name for all that music and all those records and concerts and musicians who’ve been part of my big extended family. I’m not about to leave it behind, but I’ve just tried to put it in a little bit of a perspective. SPAZ: The expanded four disc version of Passion Play has also just been released. Are you amazed at what Steven Wilson does with these mixes? What specific qualities does he bring to the remix/remaster work? He really seems to understand the music. IAN: He grew up with a strong awareness of the bands that had begun that journey into more progressive rock music. He’s obviously a bit younger than I am, but he came to my attention at a time when EMI were looking to remix and remaster some of the old things in 5.1 surround and so on. I read about Steven Wilson doing some work with Robert Fripp remastering some King Crimson stuff, so I thought, “well, obviously this guy knows what he’s doing.” So I directed EMI to Steven who said yes, he’d like to have a go at doing something. I think it was Aqualung he started with, and he went off and did a couple of test mixes, which he sent to me and we talked about it and I thought this guy has got a lot of sympathetic natural ways of listening to things to give you a clarity, a little edge, a little definition, but not to fundamentally change either the stereo layout, the positioning of instruments, or to hugely change the sound and the balance of things. He just gives it clarity and polish and I know exactly how he does it because I worked with Steven on it. Two days ago I was listening to Steven in the studio as we were working on a remaster of the War Child album from 1974. He’s a good guy and I’m sure he will do a good job as long as he wants to keep doing it… but he’s got his own life to live, and I have to feel sometimes a little embarrassed that he keeps being given yet another old Jethro Tull album to remaster. So, I mean, I think his enthusiasm at some point will wane. I’ve said to him, “Steven, you know, when the moment comes and you’d rather be washing your hair or practicing yoga or making a health food supper or whatever you do, just say the word.” Because the last thing I’d ever want him to do is feel obligated to have to remaster thirty albums. He’s already done about six, so I feel a bit embarrassed about the hours that he has to put in on all of this. SPAZ: Do you feel that downloads and streaming have decreased the attention span of the average music buyer who is more interested in songs than albums? IAN: Well, I don’t think that it is responsible. I think the reality is that some people don’t really have the time in the day to sit and concentrate and focus just on listening to a piece of music. Music is a backdrop. It’s something that is around them. They listen to it in the car on the way to work or on the train or on the bus or on the airplane. It’s something there without really having to think too much about it. I have to accept that some people will listen to my music that way, so I’ve got to cater to them, as part of the job of giving people choices to how they listen to music. Those who do want to sit and close their eyes with a great pair of headphones on or some wonderful speakers and really kind of absorb themselves in the music—I’ve got to cater to that too. You have to give people all the options whether they’re in the digital domain or whether they’re listening to a vinyl cut. I’ve got to do [vinyl cuts] as well again these days. It’s all about recognizing and respecting the fact that people have different ways of listening to music and different needs for listening to music. I have really got to make sure that as a record producer I am there to try and cater to those needs and give people a choice.